New Prices on prints…or save even more by purchasing the electronic file for the image you want and having it emailed to you to have printed at your convenience! Get another discount by paying via PayPal. 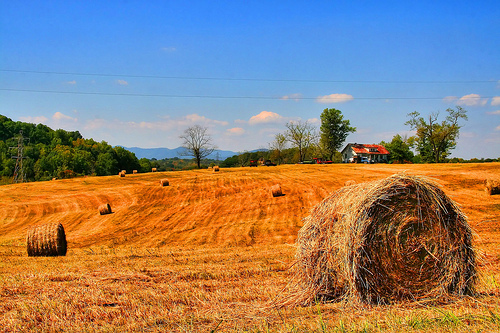 This entry was posted in Art, Back Roads, Digital Art, Environment, Images, Life, Nature, Photographic Art, Photography, Photos, Photoshop, Spiritual, Topaz Adjust, Travel, Visual Arts and tagged Amherst County, Back Roads, Blue Ridge Mountains, D L Ennis, farmhouse, fields, hay bales, Hay Baling Days, Virginia. Bookmark the permalink. This reminds me of my childhood growing up in the midwest! Great shot! Thank you, I’ve recently been incisive for information about this topic for ages and yours is the best I have learned so far. But, what about the conclusion? Are you sure about the source? It would be fun to see how many times it’s added and then watch him remove each. Over the Hill with teenagers!